"Believe Me" takes a look at white evangelicals' support for Donald Trump and finds that this act is not an anomaly, neither have these evangelicals lost control of their minds. The author, however, declares that Donald Trump is unlike any other presidential candidate the white evangelicals have ever supported and proceeds to answer why this is so. First and foremost, I think Christians will benefit most from the book because of the themes it tackles as well as the historical precedents that put the recent support of white evangelical for Donald Trump in a well-defined context. Any reader who loves history and politics will also gain some value from this book. This book stays on white evangelicals' fear of foreigners, lust for power to enact policies that favour their views of morality, and the nostalgia for years past when Protestantism and whiteness used to be a key to wealth and power. The author glances back at years past even before the nation called the United States of America was formed to examine the root of evangelical's approach to politics and how past events came to define how they act in time of elections. The book made good use of research, interviews, and examination of statements from past and present key figures within the white evangelical circle to explain why the desire to change society through political power ranks high on their strategies. More importantly, the book tries to show the futility of advancing any cause through negativity and shows us a better way. 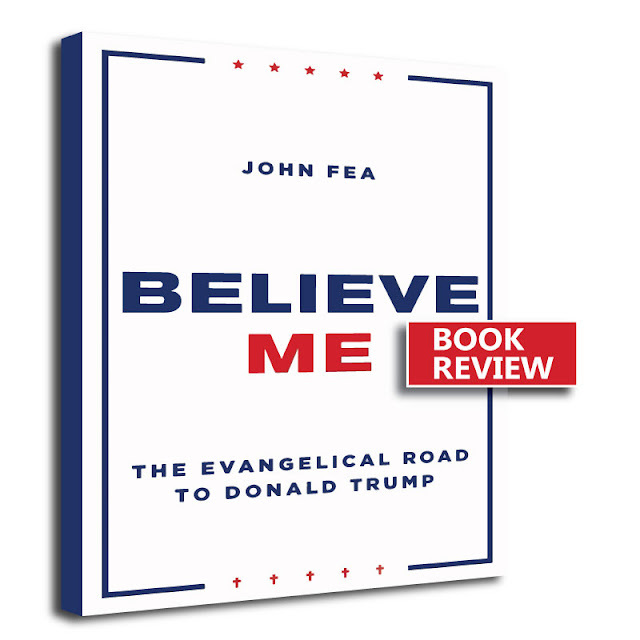 Believe Me: The Evangelical Road to Donald Trump by John Fea is available to buy from on all major online bookstores from June 2018. Many thanks to Wm. B. Eerdmans Publishing Company for review copy.